The bull terrier is a friendly and active dog breed, which is surprising considering bull terriers were originally bred to be fighting dogs. They are often called "kids in a dog suit" due to their overly friendly and humorous behavior. The breed gained popularity after their appearance as the Budweiser dog in commercials in the late 1980's and again as the Target mascot in the 2000's. Bull terriers are friendly, however they were bred as fighting dogs and will need early socialization to keep them from becoming aggressive around other dogs. 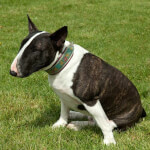 The bull terrier comes in two different sizes, standard and miniature. 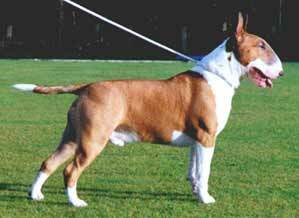 Miniature bull terriers weigh between 20-35 pounds while standard bull terriers range from 40-80 pounds. The breed's characteristics and behavior is the same regardless of the size. Even though bull terriers were originally bred to fight, the breed has become much more gentle. Today the breed is a fun-loving friendly companion dog. However, bull terriers can still become aggressive towards other dogs, so it's recommended to socialize them at a young age and consider neutering males. The breed is known to become attached to their owners, so they are not recommended for families who spend the majority of their day away. Bull terriers are fairly easy to groom. Their short coats need to be brushed once weekly and they only need to be bathed as needed to prevent odors from developing. The breed needs moderate exercise daily, which can be met with 30-60 minutes of walking or play time. Lack of exercise can cause hyperactivity which may lead to destructive behavior. Bull Terrier history as you might expect, contains a bit of fighting, a bit of pest extermination and a lot of companionship. The origin is all in the name-- Bulldogs were crossed with various EuropeanTerriers in the name of creating a more agile fighting dog; bloodsports were, of course, legal during this time but the modern Bull Terrier has been through quite the evolution. Although popularity skyrocketed among lower classes of England, with the downfall of cruel dog fighting the breed's skills were seen in a different light by a new set of fanciers. Since there were no strict standards at the time (only performance mattered) it was James Hinks of Birmingham that decided to create a gentleman's dog out of this scrappy bull and terrier mix. 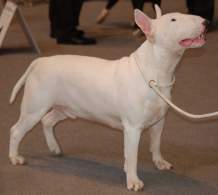 The first English Bull Terrier was shown in 1862 and it is supposed that Hinks included breeds such as the bulldog, English White Terrier and Dalmatian in his program to make the Bull Terrier. He specifically bred for white individuals and the breed was therefore dubbed "The White Cavalier". The breed was a hit in the show ring due to his unique looks and charming, obedient temperament. Later, breeds such as the Whippet, Spanish Pointer, Borzoi and Rough Collie were used to refine the look and eliminate the stop-- giving them the characteristic "egg shaped" flat head. The popularity of Bull Terriers continued to climb and they were recognized by the AKC in 1885. Unfortunately, the selection for white individuals had resulted in a high incidence of deafness among these dogs so, in the early 1900s, the breed was crossed with Staffordshire Bull Terriers to introduce color to the coat (to reduce the incidence of deafness causing genes). Today, most Bull Terriers and extremely loving, friendly companions! First and foremost, this breed is about the impression they give off-- they should appear muscular, strong, active and spirited. The most notable characteristics, in most people's minds, involve the Bull Terrier head and face. First, it is long and full (not tapering to the muzzle) with triangular, dark eyes set towards the sides of the face. The Bull Terrier's ears are medium sized, erect triangles set atop the head. Who can forget the English Bull Terrier's nose-- it's the physical hallmark of the breed! 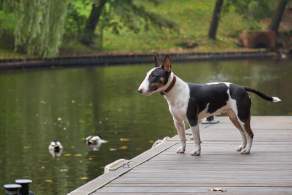 There is no stop between the skull and muzzle so there is a curve downwards into the nose; although blue or red nose Bull Terriers may be desirable to some, the color is not considered standard and black is preferable. English Bull Terriers have coats that are short, lie flat, and have a little glossiness to them, however, they are rough to the touch. The legs are solid boned and thick and the short, tapering tail is usually carried horizontally. Combinations of these colors are also allowable and, due to the highly variable nature of what is considered acceptable per Kennel Club, we recommend you view your country's Kennel Club webpage for a full list. 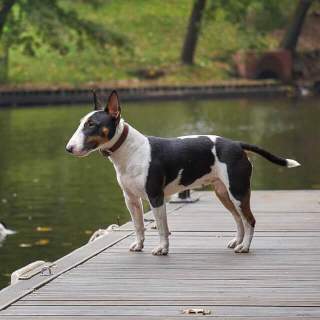 We can give you a few general details, however, such as that black Bull Terriers are highly sought after while brindle Bull Terriers are the most desirable for many Kennel Clubs (if the coat is colored). 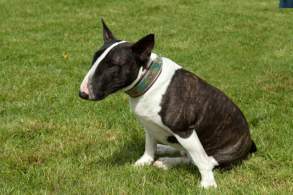 Brown (Liver) or Blue Bull Terriers are not preferred according to these standards. The Bull Terrier's size is usually considered to be large although they may look compact. 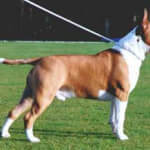 Many Kennel Clubs, including the UKC and AKC, have no height or weight requirements for Bull Terriers. The emphasis in the breeding program is based upon the impression that they are compact, muscular, strong and active. Most breeders can tell you the average size of their dogs and the size of the dam and sire so you can have some idea of what to expect of your fully grown BT. Plenty of these owners and breeders have posted Bull Terrier weight/size charts on their websites that, in general, show the average weight to fall in between 45-65 pounds. Females should be lower in the weight range than males. Unlike many breeds, there actually is an official size variant for the BT. The Miniature Bull Terrier is AKC recognized as a separate breed but is almost identical to the standard Bull Terrier. The Roman Nose, charming personality and comical quirks are still there, just the size is smaller than the big Bull Terrier. Minis stand 10-14 inches at the shoulder; as with the standard, the wight should be in proportion as to give them a compact, strong, muscular look. Be weary of those offering Teacup or Toy Bull Terriers as these are not an officially recognized types of English Bull Terriers. The biggest Bull Terriers don't often exceed 65 pounds and the smallest aren't usually larger than 10 inches and healthy individuals will most often fall within specified ranges. 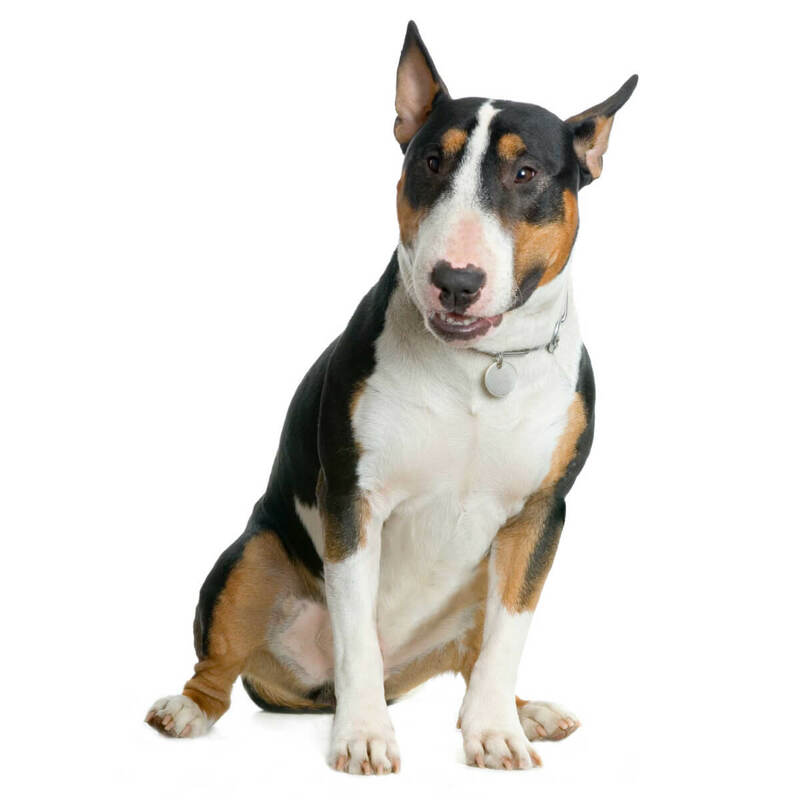 The Bull Terrier's temperament, according to the AKC, is like that of a young child. Frisky and mischievous, yet loyal and charismatic, the Bull Terrier's personality and characteristics have a way of drawing you in. It's easy to get frustrated with their independence and stubbornness sometimes, so the breed is best for an experienced owner. That's not to say they don't respond well to training-- they do and they can be very obedient and reactive to correction, however, you must be as consistent and willful as they are. They respond well to treat and toy based training. For those wondering "Is the Bull Terrier temperament protective? 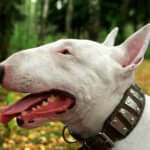 ", the loyal Bull Terrier does exhibit protective behavior. They are extremely people friendly dogs, however, and won't likely exhibit this trait (or even bark, really) unless they deem it necessary. To be frank, their look is more intimidating than their personality. The English Bull Terrier temperament proves to be a great asset when children are involved, playful and exuberant, he/she is also a child at heart. They will need intensive early socialization to get along well with other pets. Bull Terriers and kids will be fast friends! This breed is notoriously people friendly and is even said to have the personality of a child, themselves. They are playful, mischievous, adventurous, affectionate, loyal-- plus they aren't fragile. Keep in mind this dog's exuberant spirit, however, because even a baby Bull Terrier should be supervised around small kids to prevent accidental hazards such as knocking them over. They are prone to jumping and nipping if not trained early. This is where the information turns fuzzy because your English Bull Terrier and your cat may coexist without any problems-- or not. They are said to retain some prey drive and, although most owners agree that they get along fine with other pets, it's very important to socialize them with other pets as early as possible. This breed should either be on leash or in fenced area when let outside. Bull Terriers and other dogs have a similar relationship. They tend to do fine if they are brought up around and socialized with other dogs. They don't have a history as pack dogs, however, so they may display some territorial behaviors. These factors are definitely something to consider before adding one to a multi-pet household. Below are pictures of the Bull Terrier dog breed. Owning a Bull Terrier can be the best choice you ever made while still being challenging. They have many Terrier qualities such independence, curiosity and stubbornness-- they are highly mischievous! This means you can't leave them home alone for unreasonable amounts of time without coming home to mess or destruction; normal activities such as work and school are fine. This also means you should keep them on leash when not in an enclosed area such as a fenced yard; while on the subject of yards we should mention a large, fenced one is ideal. They need about an hour outdoor playtime daily to burn out that Terrier fire. While these dogs are noted for being extraordinarily people friendly, they are more so with their families and familiar faces. An untrained, unsocialized BT can become overprotective and a liability. On the flipside they don't bark unless necessary and they love to be indoors with you (and have a good cuddle) so long as they have daily outdoor access. 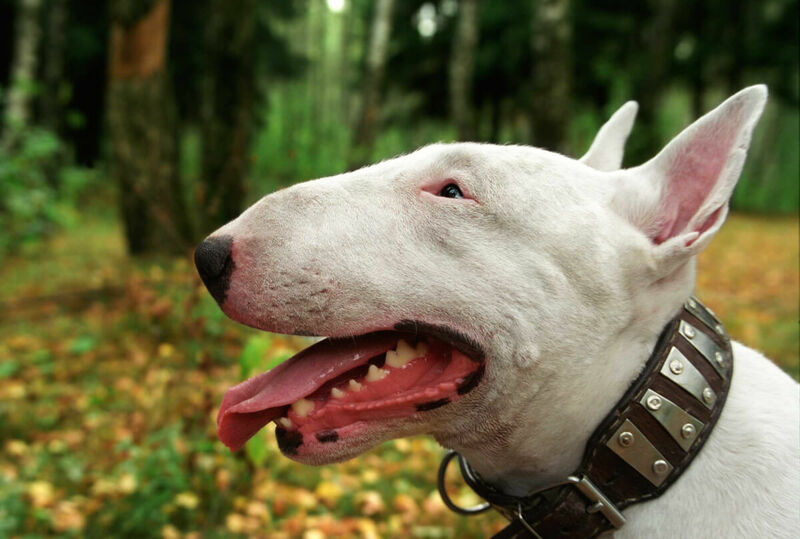 Bull Terriers are NOT hypoallergenic. They may have a short coat that is easy to keep maintained but they are seasonal shedders. Although there is a fair amount that consider the Bull Terrier ugly, the process of breeding the Roman Nose into the original "White Cavalier" was purposeful and involved mating with breeds such as Borzois and Rough Coated Collies. There are thousands searching for Roman Nosed Bull Terrier Puppies for sale every single month. There is an AKC recognized Mini version of the English Bull Terrier. Deafness may affect up to 18% of all BTs, especially the white coated ones. They are prone to OCD (Obsessive Compulsive Disorder) so if they repeatedly perform the same activity (more than normal) he/she may have this psychological disorder. All colors other than white were once considered a separate breed. English Bull Terriers are popularly used on TV and in print ads. This breed usually has a lifespan up to 9-15 years with 9 being the average; this means there are some individuals that don't make it to 9 while others live to a ripe old age. 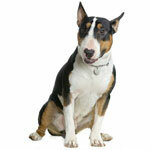 Bull Terriers, like all breeds, are prone to a few health issues-- some hereditary, some not. A responsible breeder will be able to answer any of your health related questions and some will even have certifications of hip, eye or genetic testing done for the parents. Don't be afraid to ask questions and don't skip your routine veterinary visits! Lens Luxation occurs when the ligament holding the lens diminished over time, causing it to slip out of place in the eye. Kidney disease is a common serious problem that usually results in early death. Polycystic Kidney is one such example; these issues can be detected via blood test.